1997: 18-87-8 = 113 points (31st). 31/08/1997: 95-95-88 = 278 points (5th). 01/09/1996: 82-82-83 = 247 points (10th). 17/11/1996: 89-85-94 = 268 points. 1994: Offene Klasse V 1. 1996: Offene Klasse V 1. 30-05-1993: Offene Klasse V 1 / CAC-Reserve. 28-03-1993: Offene Klasse V 1 / CAC. Overall Build: Powerful heavy; short fur; good colour and markings; head slightly short, strong forehead, strong upper-jaw, sufficient under-jaw; eyes medium-brown; firm back in motion; good croup; good angulation; free gaiting, good firmness in the ligaments and joints. Note: Highly recommended to improve the character and confirmation. Cöbes von Warringhof competed in the Deutsche Meisterschaft in 1997 and passed the Körung 'for life' with V rating and highest possible ratings for working drives (very high protection and fighting spirit, high courage and hardness with middle sharpness). His sire, Bingo von der Weyermühle, and dam, Dunja vom Worringer Bruch, both passed the Körung 'for life' with highest possible ratings for hardness and working drives (very high protection, fighting spirit, courage and hardness with middle sharpness). Cöbes lived to 8 years of age, his sire to 10 years of age and his dam to 11 years of age. Alfa: SchH 3, FH, D.V. Meisterschaft multi-participant and passed the Körung 'for life' with highest possible ratings for working drives and hardness (very high protection and fighting spirit, high courage and hardness with middle sharpness) with V rating. She is dam of the von Warringhof “D, F, H, J, L” litters (Janka, Hel). Aisha: SchH 3 and passed the Körung 'for life' with highest possible ratings for working drives and hardness (very high protection and fighting spirit, high courage and hardness with middle sharpness) with V 1A rating. Cocoa: SchH 1 and passed the ZTP with highest possible rating for protection, courage, fighting drive, self-assuredness and high hardness. She is dam of the vom Blitzkrieger “A, B” litters (Allee, Aisin, Baron, Bogart, Bo, Bren). Avanti: IPO 3 and passed the ZTP with 1A rating for character and V for conformation. She is dam of the vom Eschenbruch “C, G, J, L” litters (Cuba, Lucky). Ben: IPO 3 and passed the Körung 'for life' with Körklasse 2A rating. 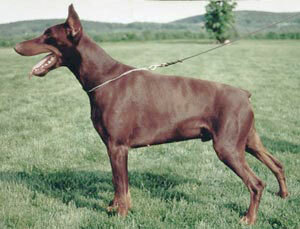 He is sire of the vom Ferrenberg “C” litter (Cleo) and vom Eschenbruch “I, M” litters (Inou). Odett: SchH 1 and dam of the von der Krillenburg “L, M, N” litters (Lussi, Martha).